Have you ever found yourself yearning for a travel-size guitar that was a bit more, well, travel-size? Have you ever found yourself yearning for a travel-size guitar that was a bit more, well, travel-size? If so, a new guitar called the Jammy might be just what you’ve been looking for. 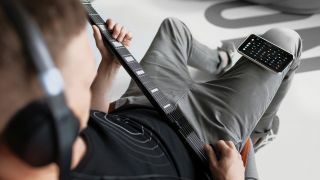 Developed by RnD64, and funded to the tune of well over $170,000 by an Indiegogo campaign, the Jammy is a 17-inch long, portable, digital travel guitar that features 15 standard-sized frets and a detachable neck. Purportedly, the guitar can fit into most backpacks and is small enough to comply with most airlines’ carry-on regulations. RnD64 CEO Dmitry Shemet says the idea for the guitar came from a chance interaction at the office. The Jammy originally featured a sliding neck, but — when the company found that the neck sacrificed playability for the sake of portability — this was replaced by its current, detachable neck. All of the guitar’s previously fitted electronics remained intact. The fully autonomous, battery-powered axe features two audio outputs: 1/8- and 1/4-inch jacks, allowing guitarists to stick in regular earphones or plug straight into an amp. The guitar’s sound is generated and processed on board, so different effects can be used without the need of a mobile app. That said, the Jammy does have an accompanying mobile app, featuring an auto-recording feature that captures everything users play, allowing them to retrieve their sessions. It also features a metronome, different tunings and guitar types — electric, acoustic and classical — plus set backing tracks in a number of different genres. The Jammy will be available later this year for $349. For more information, visit playjammy.com.